Once I had my data SIM card two days ago, I signed up with Memphis Tour, a local tour company, for an overnight trip to Cairo. I’ve overheard many others on the ship who have signed up with the same company. Usually, I like to travel independently but I only had two days in Alexandria. It would be easier going with a group than figuring out how to head to Cairo by train on my own. There was a hiccup during pick up. Many tour members got different timings: 6:00am, 7:00am and 8:30am. Mine was 7:00am so I was not too early or too late. We did leave before 8:30am and zipped off to Giza. Along the highway, we passed many plantations with produce such as dates, oranges, grapes, wheat and olives (not that I could tell them from my seat on the bus). I didn’t realize there would be so much plants as I thought it was like Jordan with its expanse of desert. When our bus rolled into Giza, everyone was excited to see the tips of the pyramids peeping from the top of buildings and trees. 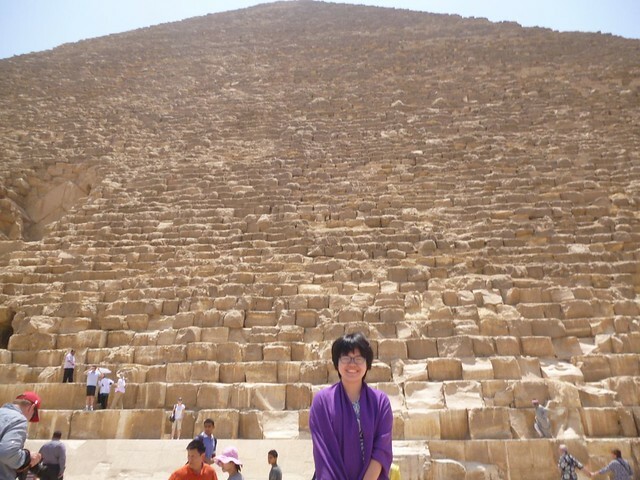 When we got close, I was stunned to find how humungous the Great Pyramid was. It’s HUGE!!! One block of stone was about the height of my waist. We were given photo opportunities outside of the Great Pyramid but our guide told us not to go in because of the low ceiling and having nothing much to see there. Beware of conmen around the Great Pyramid. No one can be trusted. When we were going back to the bus, I witness one of the conmen outside the pyramids. He stuffed a blue chip into the hands of one of our passengers. When the passenger returned the chip, the conman asked him for money. He followed the poor passenger around until he was given money. Next stop was our camel ride through the desert. I paid US$10 for it but it was worth 2 times the money. It’s a fun ride from the top of a dune to about 2km way where our bus picked us up. 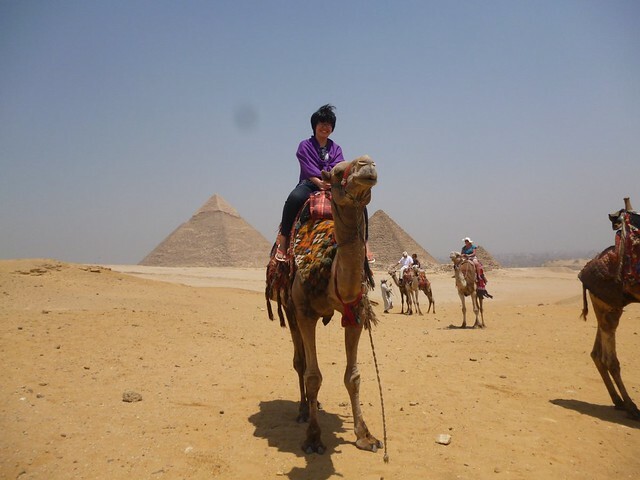 I did smell like camel poop afterwards though. We headed to the Sphinx near the pyramids. I was very disappointed that the Sphinx wasn’t as big as I imagined. I sound like a spoilt tourist, don’t I? 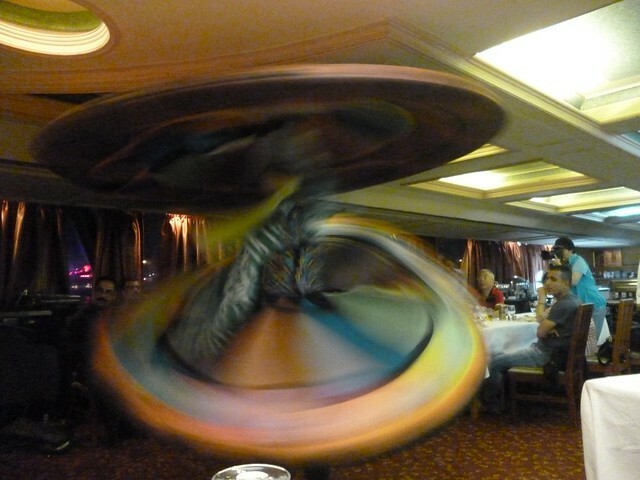 Only two other travelers from our tour group went with me to the Nile dinner cruise. We had the chance to be in a small car and in the crazy Cairo-Giza traffic. I think that alone was worth the trip. We got on a boat and sat in the airconditioned dining room. The food was “tourist food” which meant few spices, although the rice pudding was nice. While we ate, two singers sang. The man sang Arabic songs while the women sang French songs. After a long wait, the belly dance lady finally arrived. Our journey back from Cairo to Giza was pleasant. I saw mosque with lighted towers like Christmas trees, something I don’t see in Malaysia or Singapore.